A slow burner of an issue, but the return of the Kingpin to New York, in an underground bar called Josie’s, was priceless. You could have heard a pin drop in there. The art was amazing (as usual), whether it was portraying tension in a dimly lit bar or the confusion and stealth of an attack of The Hand ninjas in the half light with snow swirling around them, Lark and Gaudiano nailed it. There was plenty of focus on Matt Murdock and his travails, not least over the custody of his child and his relationship with Dakota, which slowed the pace down a little in the middle of the book. 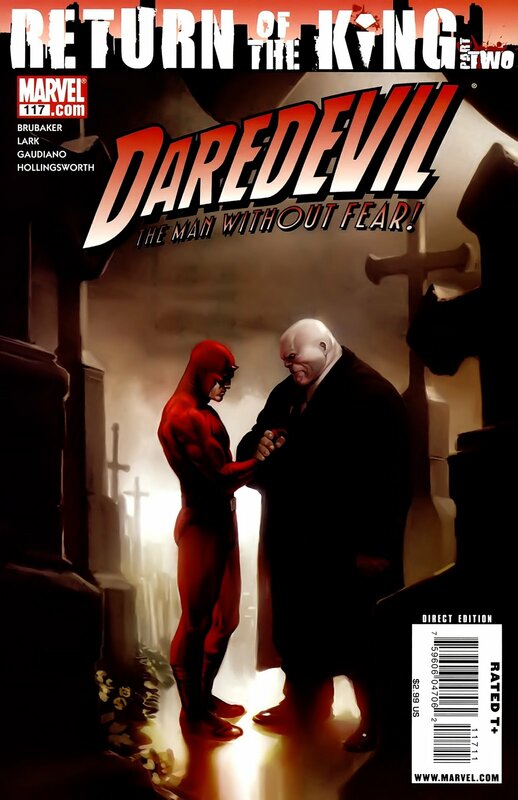 However, the real meat of the issue was near the end – it was a generally well paced issue, leading up to this climatic moment – when Daredevil and Kingpin call a truce, and more than that, forge an alliance. Dardevil ~117 is out now, published by Marvel.